Here are pics from my very first ply-job. Why did I wait so long to try this? I love to ply! 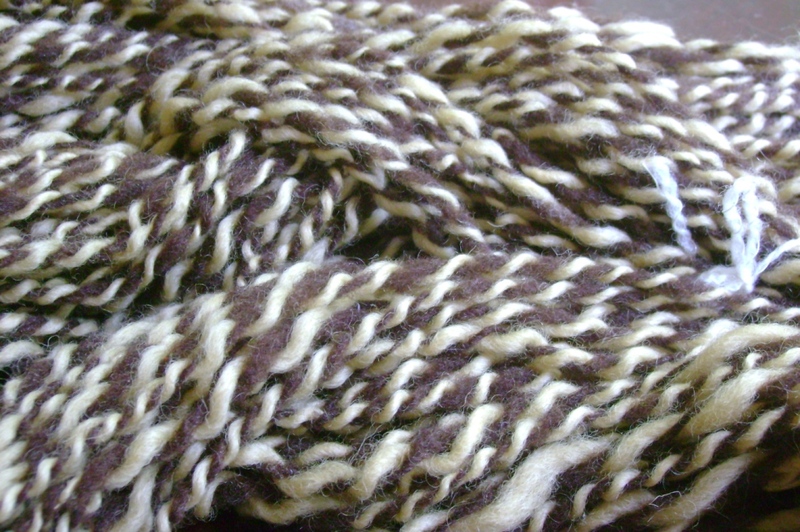 This is the dandelion-dyed Shetland plied with a natural cocoa-brown Corriedale single I spun several months before. It turned out bulky and squishy and yummy! Not sure I’m going to list this for sale in my Etsy shop, Cold Hands Warm Art, because I think I plied it a little too loosely, though the skeins hang nice and straight as if to say, “check out my balance!” I’ve been eyeballing the Kitty Pi cat bed pattern by Wendy Johnson of Wendy Knits, and I think this yarn would be a great match for it. Plus, with black and white cats, I need a cat bed that hides both dark and light fur. Entry filed under: Sheep to Yarn Process, Spinning. 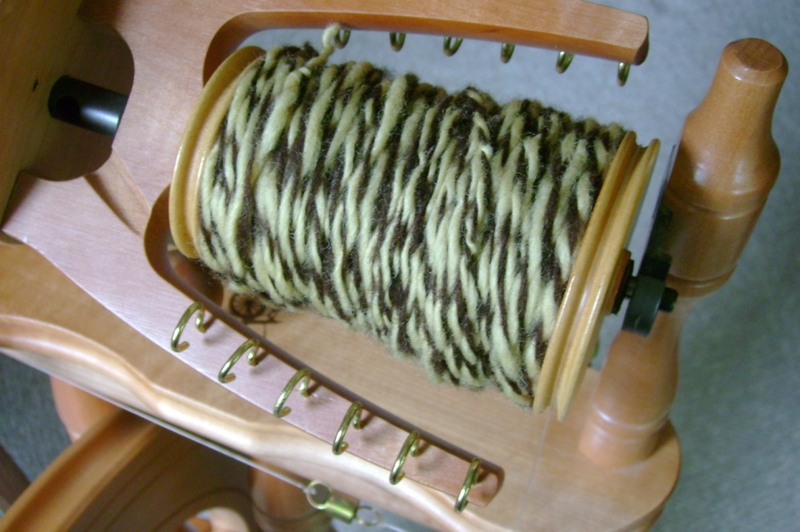 Tags: Corriedale, plying, Shetland, spinning. Hmm, I think the cat bed could be made in crochet too. Nice job plying! I had big plans to do a three ply merino today, my spinning mentor had suggested that a three ply would make the yarn rounder (whereas a two ply sometimes leaves it flatter) but then I noticed there were two full spools waiting patiently on the Traveller, so I couldn’t resist. Did one two ply with both of them, but by the time I got to the second bobbin full, one of my full bobbins exhausted itself whie the other bobbin was going strong. What to do? I tried that “navajo ply” that I’d never done before, which looks rounder, like a 3 ply. Odd technique. You could try and sell some…as they say “Nothing ventured nothing gained”. Last night I spent some time catching up on conversations in the Ravelry forums. There was an interesting discussion about selling homespun yarn. Some members expressed frustration that sale of “low-quality” or “beginner” yarn would hurt the homespun market by depressing the price, creating an impression of poor quality or both. On another forum, members were discussing tightness of ply, where the conclusion seemed to be that loosely plied yarns have their uses (especially for low-wear, felted items–like a Kitty Pi!) 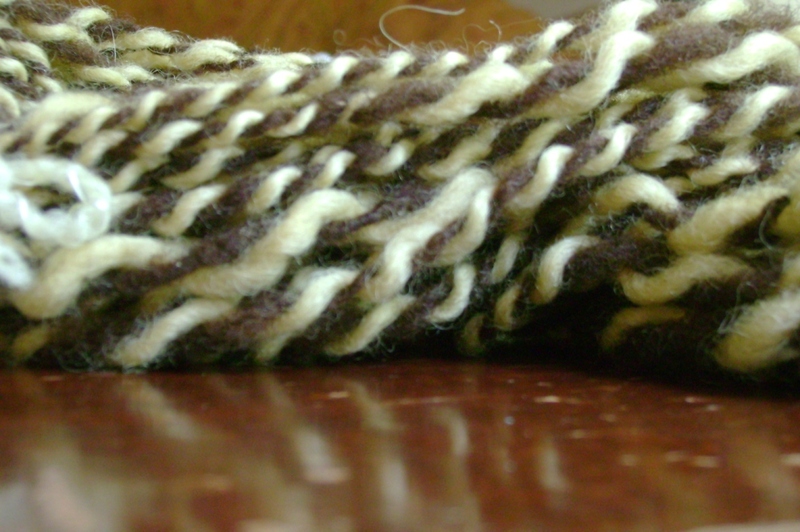 and tightly plied yarns should be used for high-wear items like socks. LOVE your Victorian crochet shell afghan! Thanks for looking Tess. Like you not much has been happening for either with my Esty shop. I’m constantly reading every Etsy newletter and checking the forum for any bit of advise to draw traffic.